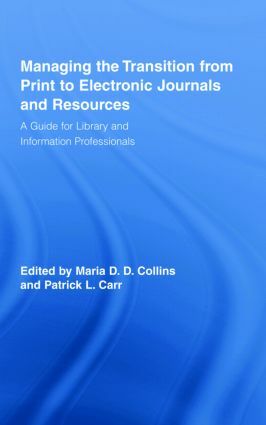 Managing the Transition from Print to Electronic Journals and Resources: A Guide for Library and Information Professionals is a collection of essays from the leading authorities on print-to-e-resource transition – from library institutions of all sizes and levels of funding. This book will help librarians and information professionals to design, implement, and manage solutions to effectively provide online access to e-journals and e-resources. Special topics discussed include reconfiguring acquisition models, electronic resource management (ERM) systems, skill sets necessary for e-resource management, efficiency enhancement, and current trends and initiatives in licensing. In addition, the wide range of articles included in Managing the Transition from Print to Electronic Journals and Resources: A Guide for Library and Information Professionals, will aid librarians in navigating the problems of changing formats, staffing issues, workflow approaches, and new and interrelated tools used to manage and provide access. Maria D. D. Collins is the Associate Head of Acquisitions at North Carolina State University Libraries. She joined NCSU in November, 2005. Prior to working at NCSU, she served as serials librarian and coordinator of serials at Mississippi State University (MSU) Libraries for six years. Maria has actively engaged the serials profession through both service and research efforts. She initiated and coordinated a regional serials workshop that is still held annually at MSU and served as column editor for a special section of the Serials Librarian for five years. She currently serves as the co-editor of the Electronic Journal Forum column for Serials Review. Her primary research interests for publication are electronic research management (ERM) and serials workflows. Maria obtained her degrees from the University of North Carolina, Chapel Hill including a BA, MAT and MSLS. She enjoys spending time at home with her husband, Leonard, and three children, Aidan, Christopher and Siddalee. Patrick L. Carr is the Electronic and Continuing Resources Acquisitions Coordinator at East Carolina University Libraries. Prior to starting at East Carolina University, he worked at Mississippi State University Libraries for three and a half years. Here, he served as Serials Librarian and then Coordinator of Serials. Patrick holds an MLS from Clarion University of Pennsylvania and an MA in English from the University of Rochester. His research has appeared in such journals as Serials Review, The Serials Librarian, Collection Management, and Current Studies in Librarianship. Patrick is an active member of the North American Serials Interest Group (NASIG) and currently serves as co-chair of the NASIG Awards & Recognition Committee. He was the 2006 recipient of the Association for Library Collections & Technical Services' First Step Award, the 2007 recipient of the American Chemical Society's Charleston Conference Scholarship, and is the reigning champion of the NASIG Annual Conference Fun Run.